last week we worked a on the topic transport and space. As this group needs action we moved and ran like a plane, a car, a bike, a boat a train, and a rocket. 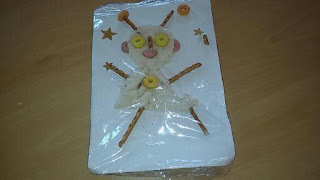 With the rocket we went to the following activity; Making an alien out of bread cereals and breadsticks. Space I Want yellow eyes ...I want orange ears , I want a red mouth, I want some bread, I want some breadsticks for the legs , for the arms. And the special word..... belly button.